Spring is starting to get itself sprung and Summer looks to be on the horizon. But as the sun starts to finally creep higher in the sky, that pesky chilly nip in the air keeps the layers of clothes on! So, it’s easy for the mind to wander away to warmer climes. 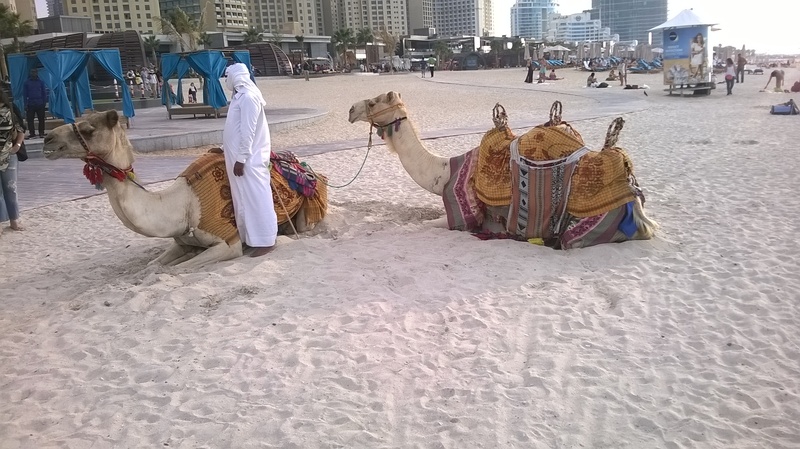 I often find myself escaping to memories of Arabian nights…and days! Yes! From daytime strolls along sunny sandy beaches to sipping chilled drinks at the hottest venues by night, Dubai may well be the perfect place to find your bliss. So come away with me by simply clicking this way – for we are off on an Arabian adventure, fillies! Dubai is a place that needs to be seen to be believed – a mirage that you can actually step into and enjoy! 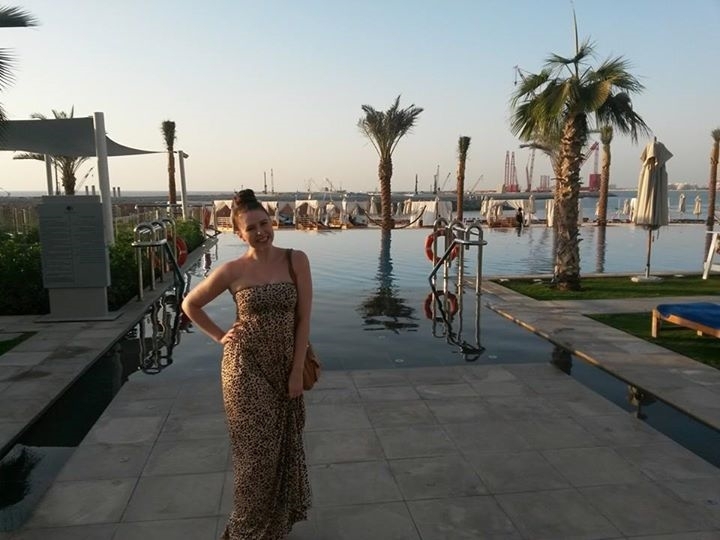 My boyfriend lived here for a time and Dubai quickly became my “happy place” that I escaped to every so often. I know, I know…It was a real chore *sigh*. As a semi-regular visitor, I got to experience not only all the touristy things but also a few experiences that come with getting to know a side less seen. 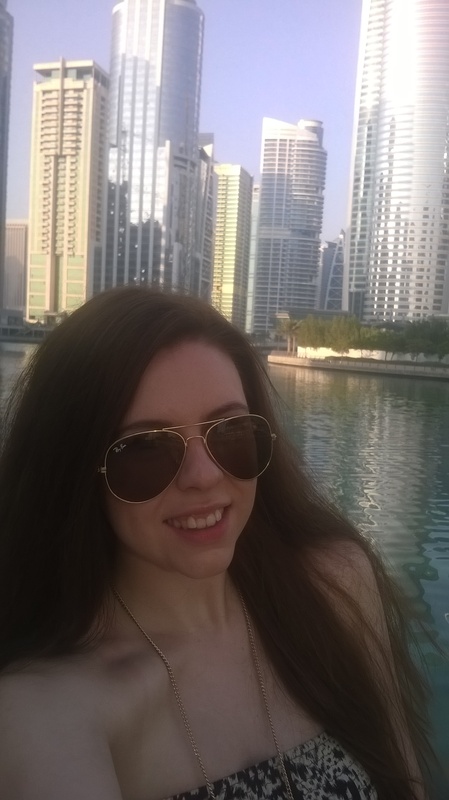 Plus I got to enjoy all the seasons of Dubai aka “Winter” in its loosest sense (which I describe as on a par with the hottest English summer you can remember) to “Summer”, where you must be prepared to sweat away all makeup! I would therefore highly recommend that if you are planning your great escape, aim for either September to November or January to March. I found great deals by booking my flights through Travelbag.co.uk. They also do great package deals, so why check out what they have on offer by clicking here! So now that you know when you are going and you’ve got yourself a sweet sweet deal…what are you going to do when you are there? Well, fear not, as I have a few recommendations for you! 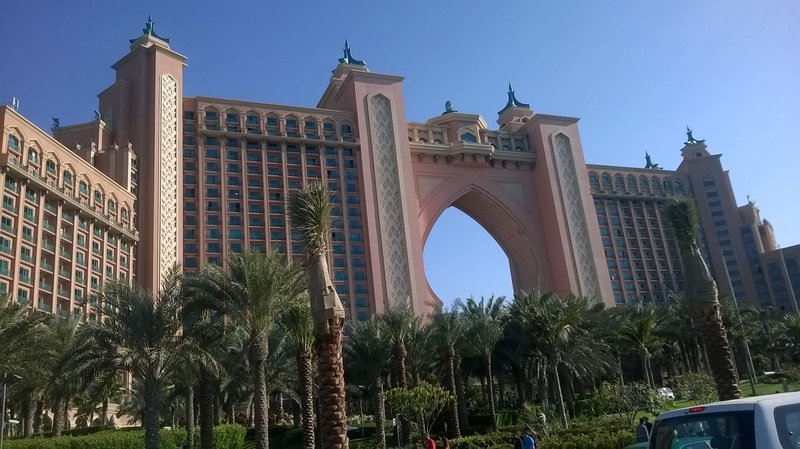 The Atlantis at The Palm is a definite Dubaian must-see, so no trip is thoroughly complete without a hop over to marvel at its man-made wonders. It has the most amazing brunch at Saffron but it is its utterly awe-inspiring aquarium “The Lost Chambers” that’ll blow you away and all other aquariums you will ever see again out of the water…literally! Discover an amazing world of aquatic-based delights as you venture around this labyrinth of underwater awesome -you will feel like you stepped into a movie set, seriously! Finding Nemo – eat your heart out. This lovely area full of gorgeous foodie cafes and lush waterside bars is utterly perfect to spend a quiet day or evening, if you want a change from the hustle and bustle for a little bit. JLT is where I stayed each time I visited and each “cluster” has its own little assortment of spas, eateries and hotels. Speaking of hotels, a lot of their bars have the greatest happy hours each night. Huzzah! So, if you are looking to be near the heart of the action, but in a little oasis of calm, it may well be worth checking out a hotel here! 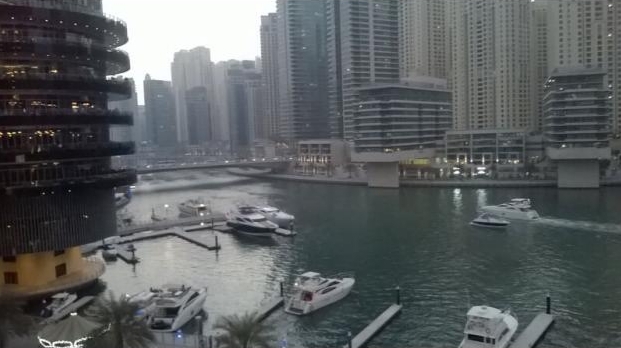 Plus you are really close to the Dubai Marina, which has its own shopping centre and is an amazing place for a spot of yacht and people watching at one of the outdoor restaurants or why not grab a drink at the Dubai Yacht Club itself? Brunch, Brunch, BRUNCH! You can not come to Dubai and NOT do Brunch, ok? Ok! It is HUGE in Dubai! All you can eat? Yes! All you can drink? Double YES!!! These extravaganzas are a legendary must for your Friday or Saturday. But…CHOOSE WISELY!!! As previously mentioned, if you wish to experience the ultimate brunch, then head to Saffron at The Atlantis for its ultra glam and full on debauchery! But if you are after something a bit more LA pool party with a relaxed vibe, then I would get yourself down to Vida in Downtown Dubai for its picnic basket based affair. But my personal pick? That would have to be at The Double Tree at the Hilton JBR. 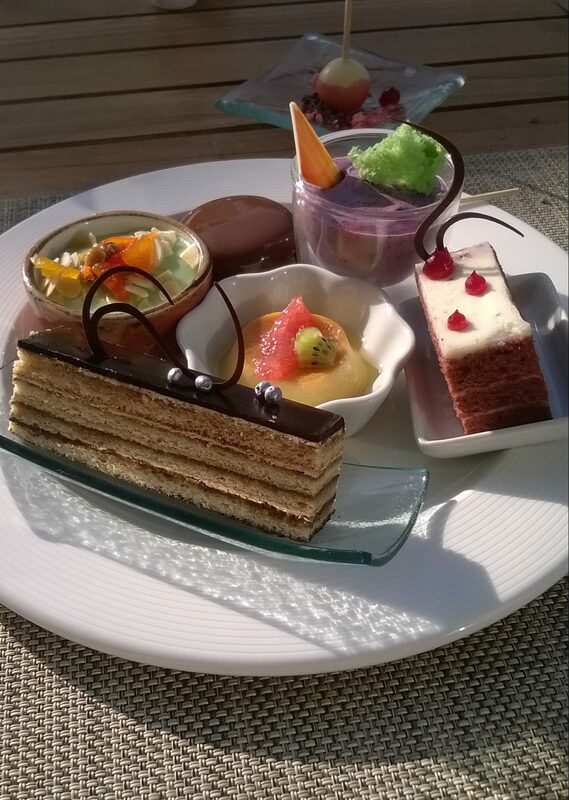 With a gut-busting allsortment of choice food-wise showcasing some of the most amazingly instagrammable desserts, your glass will never be empty as you drink in the atmosphere and the alcohol in the beautiful surroundings. After filling your boots, you can spend the day either having a massage, slipping into the infinity pool or strolling over to the hotel’s private beach where you can sit on a double sun bed to watch the sun go down with a long, cool drink. The ultimate in utter bliss! WARNING: You will be stuffed and more than likely VERY drunk. So be sure to get STRAIGHT into a cab when you decide to roll (quite possibly literally) home! Now, what IS my favourite place IN my “happy Place”, I hear you cry fillies? 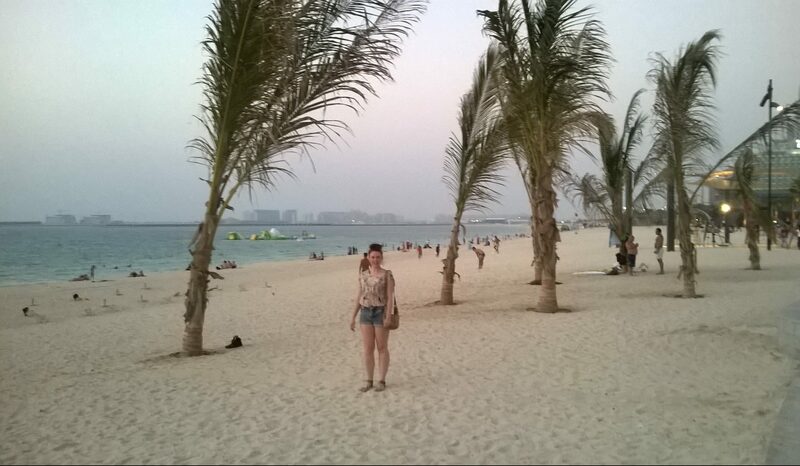 Well that would have to be The Walk at JBR! With a plethora of shops to peruse as well as its stretch of beach-front restaurants, you can easily while away the day. Whether you are soaking up the rays on the white sandy beach or indulging your credit card in some shopping before taking a splash in the warm sea in your new bikini prior to sipping on a fresh smoothie, you are going to be in paradise. My top tip? Walk away from the main stretch of bars, restaurants and past the hotels and there you will find a stretch of uncrowded sand to spend the hours on, relatively undisturbed. 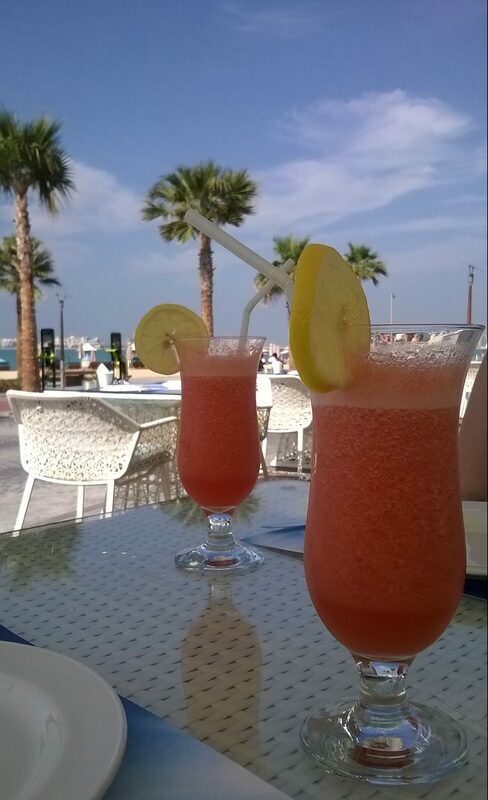 If all that doing a whole load of nothing has got you hungry, I would recommend a visit to La Bahria, for the freshest, tastiest seafood you can find – plus their juices are delicious. If however it’s your sweet tooth that needs indulging, why not seek out Morelli’s Ice Cream Parlour just off the beach for a sundae that’ll blow your mind! As the sun sets on another gorgeous day in Dubai, hang around JBR as sheesha bars pop up on the sand and the outdoor cinema kicks off! Have a spot of alfresco dining on the beach front before heading along to the other end of the sands, where open-air nightclub Zero Gravity can be found. Yup, you can party the night away under the stars whilst amazing dancers and light shows light up the sky! Want to “Come Away With Us” to other places? Head over and catch up with all our Travel posts here NOW! P.S Pssssst…LOVE keeping up with the latest FDJ LDN posts? Well, why don’t you subscribe to get them direct to your Inbox fellow filly? Just hit the button in the top right of the page or head to our Bloglovin’ and you will never miss out again! Also why not check out our Twitter, Instagram and Facebook too for more FDJ LDN goodness! Thank you so much! I love this place and couldn’t help but share. No problem 🙂 i have to go to Dubai everybody has been telling me how great it is. 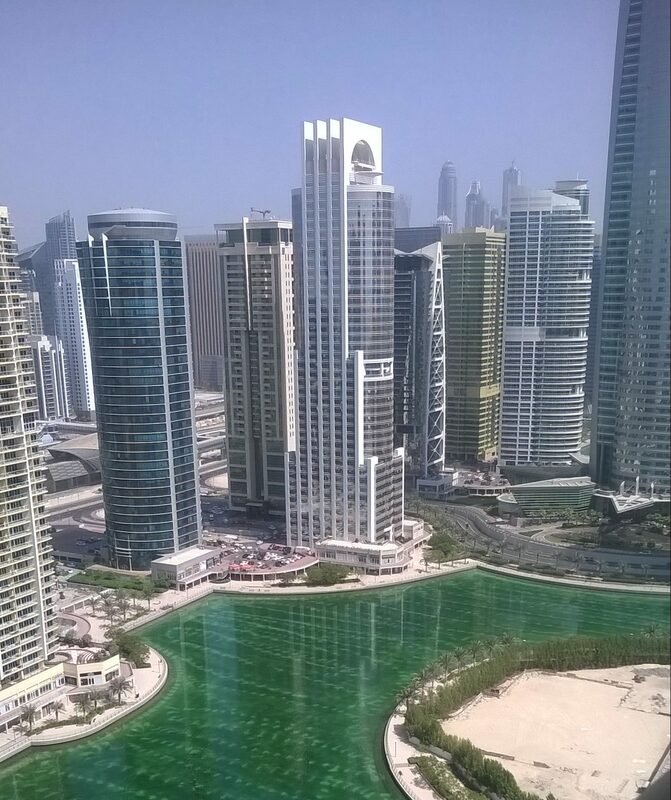 Dubai looks amazing! its on my must travel list but now i think im going to bump it up as priority! Awwww thanks Aimee! That’s so nice to hear 😀 Glad you enjoyed coming away with me! I love Dubai so much. Looking forward to visiting the beautiful place again. It’s a beauty isn’t it? I can’t wait either – so stylish too! 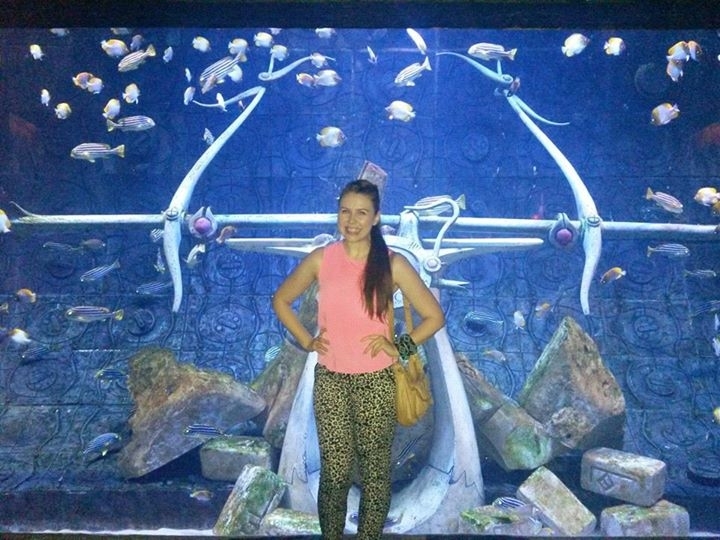 Totally – it’s a great place for families with amazing water and theme parks, as well as desert adventures and shopping. There’s some good deals on Travelbag, so keep an eye on there! It needs to be seen to be believed Kristina and it was really peaceful too – utter bliss! We went to afternoon tea in the Burj Al Arab when we went to Dubai – my son said “why didn’t you tell me they were going to treat us like kings!”. 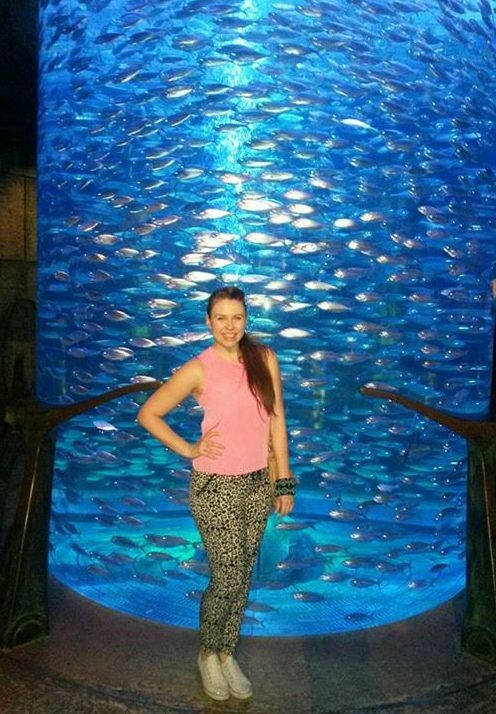 We loved Dubai, such an amazing place with so much striking architecture, would love to go back again.